How to make a delicious food recipe. MooJaa is a popular slang word meaning "My lovely pig" which is commonly used by couples who have put on a little of that "happy weight" during their relationship. 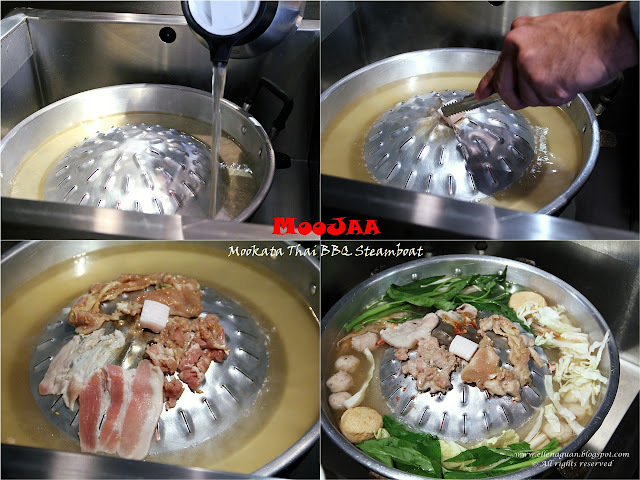 Here at MooJaa, Kookata Thai BBQ Steamboat, you could enjoy having both barbecue and hot pot at the same time like what shown above. The pot comes with a dome shaped grill which allows smoke from the charcoal to waft up to the grill and perfume the meat with "wok hei" fragrant which makes you crave for more. The selling point of MooJaa is definitely their flavoursome "soup broth", sweet and spicy homemade dipping sauces as well as fresh ingredients like meat and seafood. While flipping thru their menu, we notice that they have some Thai-style Ala Carte dishes like Basil Pork, Green Curry Chicken, Fried Garlic Pork/Chicken and etc for their lunch menu with pricing range from S$5.50 - S$8.00 inclusive of white rice and soup. Although there are quiet a few choices on the drinks menu but when comes to Thai restaurant I would either go for their Thai Ice Tea (S$2.50) or Lemongrass Drink. And I am glad I made the correct choice for having Thai Ice Tea from Moojaa which taste really good with a light refreshing after taste that is not too sweet or bitter. They are two popular dipping sauces such as Spicy BBQ (red colour) and Sweet Sour Seafood (orange colour) which the Thai chef made from scratch using 31 different ingredients. And to make these sauces it involved about six straight hours of non-stop stirring in order to prevent it from char or bun, no wonder it taste so good and like by most customers. Personally I love the Sweet Sour Seafood Sauce which taste more refreshing with hint of citrus flavour in it. At MooJaa, the owners also specially used quality Binchotan Japanese Charcoal (備長炭) which does not release smoke, ashes or other unpleasant odours like those traditional charcoal steamboat we used to have. And the moment when we saw they bring in the charcoal we were all very excited to try the food which would be cooked using the traditional way rather than gas stove. While the staff was preparing the steamboat for us, something interesting caught our attention. He actually used a cube of "Pork Lard" (in place of the butter which normally used for BBQ) to grease the grilling pot before placing the meat on it. From what he told us, this extra goodness would add great fragrance and crisp to the meats barbecued on the dome. For your information the soup broth for the hot pot section is brewed for at least five hours using chicken and pork bone which makes it so tasty even before adding in any of the hot pot ingredients. And by the time, we added in the meats, vegetables and seafood, the soup turns incredibly flavourful with the mixture of the hot pot ingredients and meaty juices from the grill. MooJaa has two types of Mookata set which are Set Moo and Set Gai both pricing at S$39.90. Basically they have the same items just that Set Moo consists of Pork Collar Set whereas Set Gai is of Boneless Chicken. 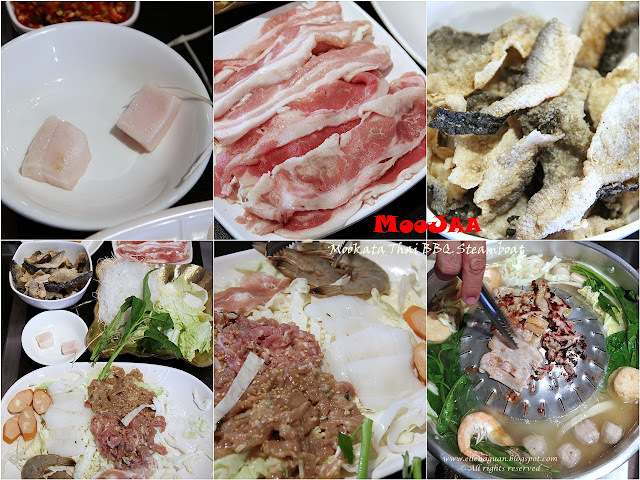 Both the Mookata sets includes Prawn, Fish/Pork Ball, Squid, Hotdog, Golden Mushroom, Vermicelli, Kang Kong and Cabbage. Furthermore they also have other Ala Carte items to add on to the Mookata such as Cheese Ball (S$8.00), Deep-fried Salmon Fish Skin (S$6.00), US Angus Beef (S$22.00) and etc which you could take a look at their Menu. Their homemade Chicken Cheese Balls (S$8.00) is one of their popular side orders which is tender when bite and the cheese filling is not too overpowering in taste too. But just be careful when you eat this as the cheese might burst and split when you bite it. One of their private dining room which could caters around 8 - 10 persons.